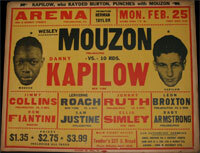 Teenage lightweight phenom, Wesley Mouzon suffered a rare loss over ten rounds against Danny Kapilow, on this day in 1946. 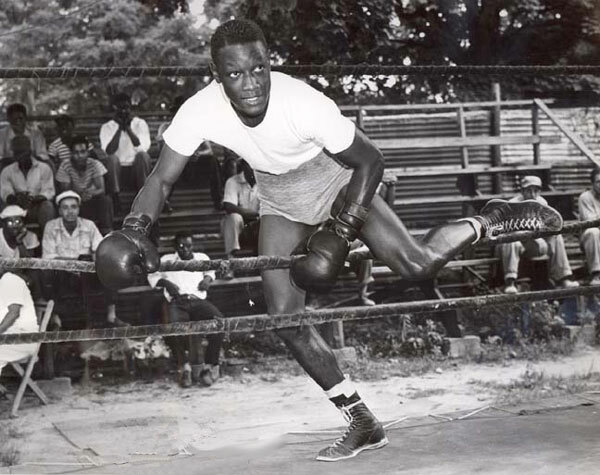 The talented boxer from North Philadelphia was coming off a non-title draw against Ike Williams, the NBA 135-pound champ. But in this bout, the experience factor seemed to have Mouzon in over his head. The NY veteran, Kapilow, jumped on Mouzon early and sustained the attack (and beating) throughout the ten rounds. By the end of the fight, Kapilow was in total control and took the unanimous decision. The surprise result was a real upset. Mouzon was one of the most gifted Philly fighters ever to come along. His brief ring tenure was loaded with impressive wins and great promise. Solid victories over fellow-Philadelphians Eddie Giosa (twice), Santa Bucca, Cueball Young and Dorsey Lay, displayed his ability early on. But his momentum continued even after he stepped up his level of competition. The surprise draw with Williams got things started, and after the loss to Kapilow, Mouzon beat former champ Leo Rodak later on in 1946. In August, Mouzon scored the biggest win of his life, when he knocked out reigning lightweight champion Bob Montgomery in the second round of a non-title fight, before 15,000 stunned Shibe Park fans. The shocking quickness and relative ease of the win marked Mouzon as a certain future champ. His title chance would come three months later. But the rematch with Montgomery was a fateful encounter for Mouzon. Montgomery reversed the result of their first meeting, emphatically scoring an 8th round knockout to defend his championship. But even more critically, Mouzon suffered a detached retina during the bout that abruptly ended his boxing career. Eventually, Wes went on to a second profession as a successful trainer.